Mythical Ireland blog: Folk memory - could local people in 1938 recall details about the construction of Newgrange that would not be confirmed until its later excavation? Folk memory - could local people in 1938 recall details about the construction of Newgrange that would not be confirmed until its later excavation? I've written before about the apparent curious persistence of local folk memory. You might recall one of the most famous examples - the fact that local people said Venus (the Morning Star) shines into Newgrange on one winter solstice morning every eight years. This had been recorded by Joseph Campbell and written about in 1958 - prior to Professor Michael O'Kelly's excavations and restoration of the roofbox, before which time any such phenomena could not be observed within the chamber. Of course, there's always the possibility that the alignment was observed indirectly, from outside the tomb entrance, and thus deduced by locals. But the thing about folklore is that it cannot always be easily dismissed as just some fanciful story. The entrance to Newgrange as it appears after Prof. O'Kelly's restoration. There are three very important tumulus in this district. They are Newgrange, Knowth and Dowth. They are within view of each other. There is supposed to be a cave running under ground from Newgrange to Dowth. Outside the entrance there is a large stone with spiral writing on it. Inside in the fort there are two large stones in the shape of a basin. It was the custom long ago for the bodies of pagan kings that died to be buried in these baisins and the ashes used to be burned. It is said that it was the Tuatha De Dannans that built those forts. It is said that they brought the stones from the Mourn Mountains to build them. It is now postulated by geologists that stones for the construction of Newgrange came from three, and possibly four sites, as follows: (1) The large kerb stones, orthostats and structural stones, which are of greywacke, were brought along the coast from Clogherhead; (2) the milky white quartz stones which form the front wall of Newgrange came from the Wicklow Mountains (although the exact site has never been conclusively located), with a possibility, recently suggested, that this quartz came alternatively from Rockabill Island off the coast at Skerries; (3) the rounded water-rolled granite and granodiorite cobbles which were interspersed with the quartz came from the beach at Rathcor/Templetown, which is on the southern shore of the Cooley Peninsula. It is said that these stones originated in the Mourne Mountains. In 1938, when the School's Collection was being gathered, the granite cobbles which originated in the Mournes were all buried under the cairn spill - material which had, over time, slipped down from the top of the cairn over the kerb stones and buried the white quartz and rounded cobbles under several feet of stones. When Professor O'Kelly excavated Newgrange, he found this layer of quartz and granite/granodiorite cobbles at the very bottom of the cairn slip. 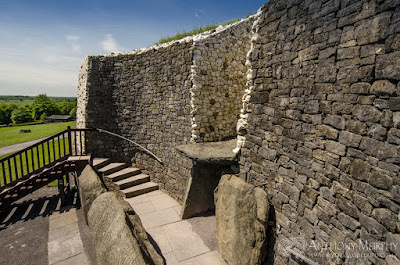 Through experimentation, he postulated that the quartz and water-rolled cobbles had originally formed an almost-vertical facing on the mound, and thus Newgrange was reconstructed in this manner. The question that arises from all this is this - how did a local man, speaking in 1938, three decades before the excavation of Newgrange, possibly know or have any indication that stones for the construction of Newgrange might have been brought from the Mournes? Is it possible that some of these cobbles had indeed been found, especially outside the entrance to the tomb, where, in 1699, the land owner Charles Campbell's servants had quarried stone for the construction of his house? There could be a more prosaic explanation. Perhaps Mr. Duggan was an educated man, who had become aware of the writings of George Wilkinson. Writing in 1845, Wilkinson had suggested that a large stone basin in the chamber of Newgrange was made from granite which originated in the Mournes. Writing in 1912, George Coffey quotes a Mr. R. Clark of the Geological Survey as suggesting that the stone from which this basin was constructed had "more resemblance to some of the granites of the Wicklow series than to those of the Mourne district." The giant lived in the cave at the river Boyne for a long time until an army came and hunted him out of it. It is said that after that he went to the cave at Newgrange and he stayed there until he died and it is said that the people put his body into a stone cup and burned it. The cup that the giant's body was burned in is in the cave at Newgrange yet. One presumes this "stone cup" referred to is one of the stone basins inside Newgrange. It is interesting that Mr. Walsh's story hints at a funerary use of the ceremonial basins. 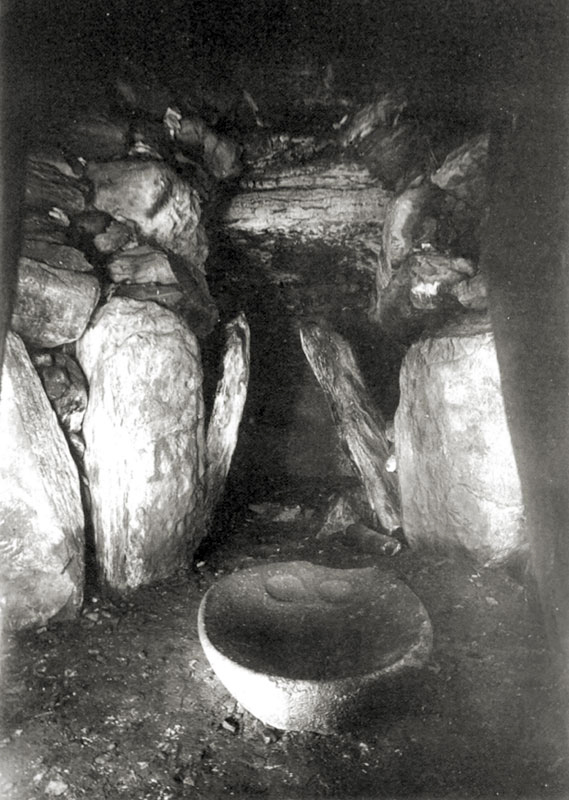 It is implied by many experts on the great passage-tombs that the interment of the fragmented remains of the deceased were placed carefully in these ritual basins. In a previous blog post, I discussed the means by which human remains might have been defleshed and cremated such that there were only small fragments left to inter. There is still the tantalising possibility, though, that Mr. Walsh's story is a folk memory of an ancient custom going back deep into prehistory, of burning the corpses of the dead, and placing their fragmented remains in stone basins or urns. The locals here in Ardagh, Co.Longford, spoke of a King bed get buried At the Back of the Hill long before Liam DePaor excavated a mound there where a regal attired skeleton was found so I do believe some of the ancient custom of passing down important information by word continues. That's quite fascinating. Thank you for the comment. Archaeologists in Ireland are starting to write about myth. One of the most interesting books I've read in recent times wass 'Archaeology and Celtic Myth' by John Waddell. A series of talks he gave in Scotland based on this book is available on YouTube. Fascinating stuff. The mention of Rockabill in connection with the quartz is interesting since it, like Newgrange, is mentioned as the home of one of the Tuatha Dé, Aed. It is Síd Dabilla. Boand's dog is said to have perished when dashed against the rocks, and she of course is said to have lived at Newgrange. Thanks for bringing this to light, Anthony. Here in Australia, Aboriginal communities have very, very long oral histories that have been shown to refer to events 10,000 years old. From Wikipedia: "An Australian linguist, R. M. W. Dixon, recording Aboriginal myths in their original languages, encountered coincidences between some of the landscape details being told about within various myths, and scientific discoveries being made about the same landscapes. In the case of the Atherton Tableland, myths tell of the origins of Lake Eacham, Lake Barrine, and Lake Euramo. Geological research dated the formative volcanic explosions described by Aboriginal myth tellers as having occurred more than 10,000 years ago. Pollen fossil sampling from the silt which had settled to the bottom of the craters confirmed the Aboriginal myth-tellers' story. When the craters were formed, eucalyptus forests dominated rather than the current wet tropical rain forests.